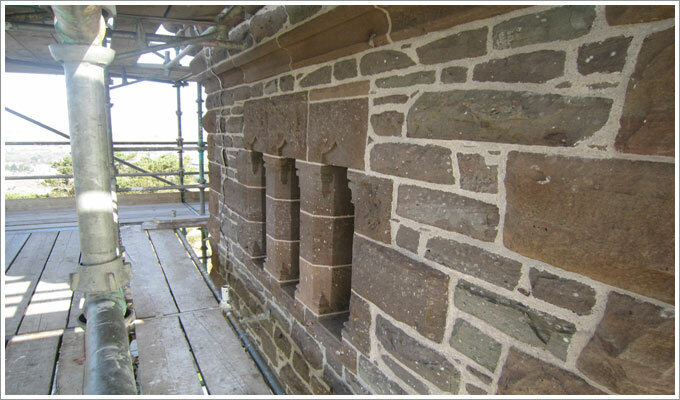 Our team of experienced lime workers have gained invaluable understanding of working with natural hydraulic lime. The combined use of stone and lime is an age old practice and the two materials work exceptionally well together: lime enables mass stone structures to breathe and also allows for movement. The use of modern materials, such as cement, are not appropriate when building or pointing mass masonry walls as these materials can accelerate the erosion of natural stone. Cement is impermeable to moisture; it retains water and this can cause erosion, dampness and decay. We always recommend the quick removal of modern materials to stop further damage to traditional structures and the team take great care when removing defective or inappropriate mortars.